Looking for the Wednesday Wandering? Just go back one entry to play with the Quail Family on holiday. Then come back and join me and Alan as we continue our exploration of some of the mysteries of American university life. JANE: I never got involved with fraternities or sororities, so I can only give the most general answer. I believe they started out as organizations to recognize and promote academic achievement. Later, the “social” fraternity or sorority evolved. These were, at least as I see them, networking organizations, intended to help students make contacts that would be useful in later life. 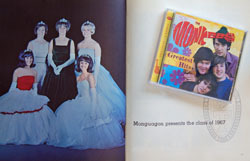 Often the members did community volunteer work or fund-raising for charities as well. In some cases, however, the organizations simply devolved into places to go for a party. Again, this is a topic where our readers will probably be able to tell you more than I can. ALAN: In descriptions I’ve read and films that touch on it, it seems that fraternities and sororities are organised in a “secret society” way, rather like the freemasons – though I don’t recall any mention of secret handshakes and the rolling up of one trouser leg. I have read about arcane fraternal initiation rituals, and hazing (a word we don’t have, though I know what it means) that sometimes gets quite out of hand. If that kind of thing was done to random strangers in the street, the perpetrators would end up in court. How do they get away with it under the fraternal umbrella? JANE: I’m not certain that hazing is much tolerated any more. Certainly, there have been a good many protests about the abuse aspect. I think the idea behind the hazing was to create a bond, something in the way of “We’ve all been through the same ordeal.” However, frankly, it gives me the creeps. ALAN: Me too! I hate bullying in all its many manifestations. The fraternities and sororities all seem to have names made up from seemingly random combinations of Greek letters. Why? And will any Greek letters do, or do certain combinations have mystical significance? JANE: I think you’re right about that. Now, I didn’t stop with the one list. Next I went to Debbie Davis, whose sorority, Beta Sigma Phi, invited me to be a speaker a few months ago. adopted the Greek letter designation, too. Movies such as “Animal House” suggest that fraternities are full of shallow self-absorbed party animals with few, if any, redeeming traits. Obviously “Animal House” exaggerates greatly for the sake of comic effect, but is there some grain of truth in that assumption? JANE: I can’t say from personal experience. Lynchburg College, where I taught for five years, did have its share of fraternities and sororities. I know the members did charity events. For several years I taught “Business Writing” (how to do resumes, cover letters, proposals, stuff like that). I had a lot of nice, clean-cut, frat boys as students. Every year, we’d go through the same routine. And, you know, Alan. They always kept the deal, so I think there was more to them than wild party animals. ALAN: That certainly gives a much more sensible and acceptable impression of frats (and sors? – what’s the accepted plural abbreviation of sororities?) than my original rather muddled ideas had suggested to me. JANE: Now it’s your turn. As we’ve been discussing the oddities American education – or at least the rituals and terms associated with it – I realized I have a few questions for you. ALAN: Well, I’ve been though the English system all the way from primary school to university and I have the scars to prove it. Ask away! A week or so back, Jim and I witnessed a mini-drama right in our own backyard. Our office has a large picture window facing east and a standard-sized window facing south. My desk is on the north end of the office, so I get to enjoy aspects of both windows. I guess that’s why I was the first to notice the flicker of movement – greyish-brown against brown – of something running across the yard. 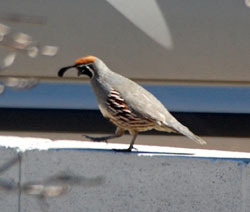 I focused and quickly identified a male Gambel’s quail. They’re very distinctive with their reddish crests constrasting against body feathers in various shades of grey and brown highlighted with white. A moment later, I spotted the more uniformly grey female, then, to my utter delight, two dusty little chicks. I alerted Jim and we watched quite happily while this avian family foraged around our lilies and blanket flowers. Then the drama started. Mister Quail jumped up on our fence, obviously ready to move along. Mrs. Quail fluttered after him a moment later. The chicks were too small to make the jump and didn’t have developed enough wings to help them along. Now, over the years, we’ve noticed that Mister Quail isn’t very bright. Puzzles that his wife works out instantly frustrate him. He’ll call after Mrs. Quail, “Dear! Dear! Where are you!” And she cries, “I’m over here. Go up and over.” Mister Quail replies, “No! No! I can’t!” Eventually, he hops down off the wall and rushes around, jumping back up onto the wall when the obstacle (a small barrier, much lower than jumps he has shown he can already make) has been bypassed. Jim and I are both sure Mrs. Quail keeps Mister for his looks, because it’s certainly not for his brains. Now, when the quail chicks couldn’t make the jump, they started peeping loudly for their parents. Right off, we noticed two very different personalities. Chick One tried to leap, using the cross pieces on the fence to get her high enough. When she couldn’t get up, she ran up and down the length of the fence trying to find a gap. Chick Two gave up much sooner. He retreated under the sacred datura and cried for his parents to come to the rescue. Eventually, Mrs. Quail came back. First she tried to talk the chicks over the fence. When that didn’t work, she came back and joined them. We were astonished how quickly the panicked chicks calmed down once they were assured Mother was near. Mister Quail was harder to convince the chicks couldn’t follow him. Over and over he called “Who-hoo! Who-hoo!” However, when the family didn’t show up, he came back and joined the little flock. They departed – presumably to the western edge of our yard where the fence boards aren’t so tightly fitted together – and we didn’t see them again for several days. Then, on Monday as we were getting off our bikes after a ride, we saw them just down the street: Mister, Mrs., and both chicks. Since then we’ve seen them out in the backyard several times. They probably like being able to get fresh water from our tiny pond. The chicks are now able to flutter over the fence, so that particular drama is concluded. Welcome to the Thursday Tangent. If you’re looking for the Wednesday Wandering, just page back and meet my friends the Stirlings and discover how they’re related to cozy disasters. Then join me and Alan as we explicate the mysteries of homecoming. JANE: I can only give you a little on this because my high school wasn’t into homecoming and I never became involved when I was in college. The “home” is the school. 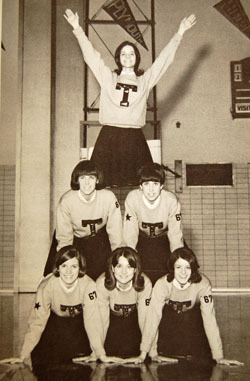 “Homecoming” usually centers around some sporting event, often with a special rival team. Graduates of the school come “home” to cheer on the team. There is a big dance later. I believe (and again, I never experienced this) the homecoming queen and her court preside over this event. ALAN: How are the homecoming queen and the members of her court chosen? Are they appointed or are they voted for? JANE: I think it’s a popularity contest of some sort. Jim says that’ s how it was at his high school. I don’t know if it’s the same everywhere. ALAN: We have absolutely no equivalent of this at all. And I really can’t imagine any reason for wanting to go back and visit my old school after leaving it all behind. Though having said this, in 2008 somebody from my old school organised a 40th anniversary reunion for the people from my year. I didn’t attend – I live on the opposite side of the world, after all. But I did participate in the emails that went backwards and forwards as we told each other what we’d been doing for the last forty years. I joked that everyone was really celebrating forty years of me not being around any more because it truly was that long since most of us had seen each other. After we left school we scattered all over the place and soon lost touch. And once the anniversary was over, we lost touch again. I have no idea what has happened to them in the four years since the anniversary. JANE: My high school closed a few years after I graduated so a lot of the continuity was lost. There have been efforts to re-establish it and I get newsletters now. I don’t live on the other side of the world from my schools, but I do live a fair distance. I think I’d need a lot of incentive to make a trip for a reunion. ALAN: By the way, we don’t graduate from school, we just leave. There isn’t a ceremony. One day you are at school, the next day you aren’t. Schools don’t have graduates, they have ex-pupils or old scholars. There is a graduation ceremony at university to formalise the awarding of a degree, but I didn’t bother going to mine. I’d passed my exams, I had my degree, what more did I need? And the thought of dressing up in a silly gown and mortar board and listening to interminable boring speeches was unbearable. JANE: Americans are very title shy. If I were still teaching college, I’d be Doctor Lindskold. However, I would be considered pretentious if I used the title socially. The only “doctors” who get recognized as such in American culture are medical doctors. ALAN: We’re just the same in this respect. My mother was terribly proud of my degree (nobody in my family had ever gone to university before, and nobody has gone since) and it was very hard for her to understand why I wouldn’t flaunt my degree at every opportunity. But the plain fact of the matter is that it just isn’t done. He was immediately ushered to his friend’s bedside. And, as he said, it wasn’t his fault that the ward sister assumed he was a medical doctor. He told her the literal truth; he wasn’t responsible for the interpretation she put on it! JANE: I did something similar to that when I was still teaching college, but it was unplanned. I needed some test results and the medical people were being slow at getting them to me. I called from work and when the receptionist asked who was calling I said, “Dr. Lindskold.” This was reflex, because that was my role at that moment. Not only did I get the results, they were given to me by the doctor himself. This has left me forever cynical. So, have I answered all your questions? Are you prepared for the world of American education? ALAN: Oh, we’ve scarcely begun – there’s lots more still puzzling me. This past weekend, our friends Jan and Steve Stirling came over for dinner. Some of you may know Steve better by his pen name, “S.M. Stirling.” I’ve known Steve and Jan since 1995, when they moved to Santa Fe from Canada. Now, I will admit, there was fear and trembling among New Mexico writers when the word arrived that S.M. Stirling was descending from the frozen reaches of Canada to take up residence in our arid wastes. This was not a typical response. Usually, New Mexico writers view the addition of another to our number with a certain amount of glee. But this was S.M. Stirling – the man who created those supreme villains, the Draka; the man whose initials – so it was rumored – stood for Sacher-Masoch. This was the man who blew up the United States. Admittedly, Stirling did this in his novel The Stone Dogs, but was this indicative of some not so deeply buried resentment against Americans? Stirling’s on-line persona – which he has admitted can be less than tactful and gentle – didn’t ease the worried hearts of those who tried to make his acquaintance over the electronic ether. And I, eager as George to continue one of Roger’s finer gestures, agreed. George and I drove to the restaurant mostly in silence, the quiet broken only by an occasional tense joke. (Do I exaggerate for effect? Probably. After all, the restaurant was only about five minutes away). We took a table in the back room, ordered coffee, and waited. We weren’t kept long. A couple clad all in black came through the doorway, pausing in that immortal manner of people looking to meet people who they have forgotten to tell to wear carnations in their buttonholes. Except for the black, the Stirlings were nothing like what we expected. There were no tattoos, no steel-studded leather, no jackboots. True, both wore their hair long, but Jan’s was tucked into a tidy little bun. Steve’s was drawn back in a neat pony tail, not free around his shoulders in the wild array one might expect. (Though, honestly, one would more likely expect a tightly shaven skinhead’s coiffure). The Stirlings were holding hands, as cute and natural as a pair of cuddly bears from a Saturday morning cartoon. They smiled when their twinned gazes came to rest upon us, recognizing the people they had come to meet. I’ve always been glad that I accepted George’s invitation to join them all for breakfast, for there I learned that Steve Stirling is nothing like what one would expect. He’s a fun person of widely varied interests. Jan shares many of those interests but has talents of her own. Suffice to say that Steven and Jan rapidly became – and have stayed – good friends to me. 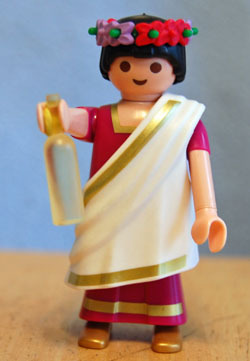 Steve loves archeology and so he had a lot in common with Jim right off. Jan’s name before she married Steve was “Moore,” so she and Jim like to joke that they are long-lost cousins. Now, back to the present… After we finished dinner (grilled chicken and zucchini with whole grain bread on the side) and were eating dessert (fresh apricots from Michael Wester’s trees), I told Steve how recently I’d read a couple of classics of disaster fiction. 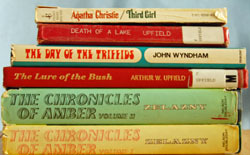 One of these was Day of the Triffids by John Wyndham. I read this one because – as many of you know – the nickname of my friend and Thursday Tangents collaborator, Alan Robson, is “the bearded triffid.” After seeing “triffid” in my in-box multiple time a week, I thought I would be a good idea if I learned what one was. I liked Day of the Triffids quite a lot. It had some clever ideas above and beyond the mobile and carnivorous plants that give their title to the book. When I mentioned to Alan that I’d read his name book, he asked “Have you read George Stewart’s Earth Abides?” He mentioned that it was another classic of the sort of “cozy disaster” novel that had been popular at the time. Well, I’d had Earth Abides on my shelf ever since it had been mentioned in the comments to my wandering on how the world hadn’t ended as predicted (“Didn’t Happen,” 5-25-11) by several people. Now I dove into it. I’ve got to admit, I was pretty disappointed. I’d thought the narrator in Day of the Triffids was a bit detached from events – especially at first. However, compared to Stewart’s Isherwood “Ish” Williams, Wyndham’s William “Bill” Masen was a dynamo of human empathy. In fact, one of the things I really like about Day of the Triffids is how Bill becomes increasingly involved in events and appreciative of other peoples’ reactions. The books do have similarities. In both, a sudden, non-nuclear disaster cripples modern civilization to the point that humanity must do without mass communication and most other technological advances. In both, the protagonists do a fair amount of solo exploration. In both, the protagonists feel confident that the stored goods (tinned food, clothing, equipment) left behind will make continued living possible without a heck of a lot of personal effort. I think this last, especially, is what led Alan to call these “cozy” disaster novels. One major difference is the narrative approach. Day of the Triffids is first person. We’re in Bill’s head for all the events. Earth Abides is a third person from Ish’s general point of view. Ish’s material is interspersed with excerpts from news reports. Later on, when there is no more news, these are replaced by analysis from a never-identified source as to what is going on in the world beyond Ish’s immediate sphere. As many of you probably already know, Steve Stirling also tells stories about a fictionalized “end of the world.” He has two series dealing with the same disaster. The series that begins with Island in the Sea of Time drops the modern island of Nantucket into the Bronze Age. The “Emberverse” series tells what happened in “our” world when modern Nantucket went into the Bronze Age. Given that I was thinking about these similar but different approaches to “cozy disaster,” I decided to ask Steve about how he felt about these two predecessors of his own novels. Like me, he preferred Day of the Triffids , though he did feel that perhaps too many interesting things (mass blindness, disease, and triffids) had been poured on early in the book. 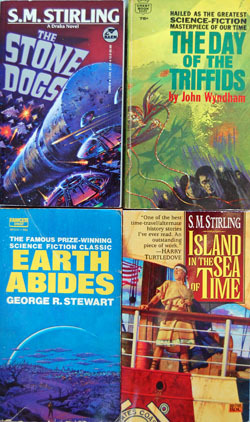 His comment about Earth Abides was that he felt it lacked a plot – that Stewart had been aiming for a “mythic” treatment. I had to protest. Myths are anything but detached and blandly explanatory. Still, Steve isn’t the first person I’ve heard describe Earth Abides as “mythic” in tone. Maybe some of you can help me out. Is Earth Abides “mythic” to you? Does Ish’s detachment contribute to a “mythic” feel? Do you like your disasters detached or do you prefer the more personal approach used by John Wyndham and S.M. Stirling? Looking for the Wednesday Wandering? Just page back and come for a walk in my garden. Then wander along as Alan and I explore the mysteries of grades and hit on some remarkable tangents along the way. JANE: Okay. This gets weird, especially since (based on talking to my sisters who have grammar school-aged children) some of the details seemed to have changed since I was a kid. Or maybe it’s just different states. Hopefully, our readers will offer some additional details. Required school starts with first grade, around the time a child is six. However, most kids go to kindergarten, which starts at age five. Kindergarten used to be basically play with, maybe, learning alphabet and numbers, but based on what I’ve heard my nieces and nephews are involved with, it seems a lot more ambitious now. Many parents opt for preschool as well. This can start as young as three. It’s often only a few days a week and not a full day. The curriculum deals with learning to play with others and not running with scissors and suchlike important life skills. Because the children are so young, it often included a nap. I can still remember the feel of lying on the nap pad (rather like today’s yoga pad) on the floor. ALAN: Yes – we have exactly the same thing. Though, given our propensity to abbreviate, New Zealanders refer to kindergarten as “kindy.” Proper school starts at age five rather than six and it’s known as primary school. As I said, first grade is where “real” school starts. That’s where I learned to read, though many children are pressed to learn earlier. Learning to read at age six certainly didn’t slow me down. In fact, I accidentally taught my younger sister Ann how to read. ALAN: Fascinating! A young boy who lives just up the road from us came home very upset from his first day at primary school. When questioned, he said that he was expecting to be taught how to read on his first day, and it hadn’t happened! So how did you manage to shield Ann from that particular trauma? JANE: There’s really very little credit to me. I’d come home from school and tell Ann (who is two grades behind me) what I’d done that day. She soaked it all up and was reading pretty well at age four. She also started writing then, including her name in script. To this day, she has excellent handwriting. ALAN: A dying skill. Nobody seems to write by hand any more. And on the rare occasions when people do, they are obviously very uncomfortable with it. They don’t seem to know how to hold a pen properly and I would imagine that the strain on their wrists and fingers makes writing very uncomfortable for them. When I was little, we actually had formal lessons in how to hold a pen. And I’m very grateful for that. I can write in longhand for hours and hours with no sense of strain whatsoever. JANE: My handwriting is lousy and those classes were a real trauma. However, I firmly value the skill. To this day, many of my stories start in handwritten form rather than on my computer. It’s as if the circuit connecting my brain to my imagination is more closely tied to handwriting than to typing. It’s always struck me as massive overkill to use a computer for that sort of thing. JANE: And maybe, for people like you and me who started out writing, not typing, a computer might not work as well. It might be different for the current crop. Okay. 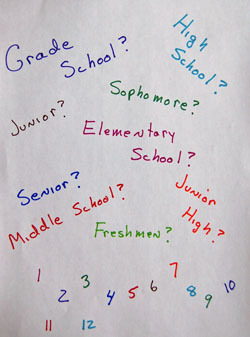 Back to terms for different stages or “grades” in school… I went to Catholic school, so the sequence was grades 1-8 as “grammar school.” Then came “high school.” This began at about age fourteen. Here “grades” stopped being called grades. Instead, students were termed freshmen, sophomores, juniors, and seniors. The term “sophomore” is derived from the Greek word for “wise fool.” It’s supposed to indicate that “know-it-all” phase teenagers go through at about age fifteen. Why it was put in there when all the other terms are standard English, I have no idea. Oddly, to me, when I went to college, some of my classmates referred to “tenth grade” or “twelfth grade,” so the terms my school used were apparently not universal. However, by college, grades are abandoned and the terms freshman, sophomore, junior, and senior are used. Or were… I hear that a lot of kids are now taking more time to get through college, so maybe those terms will die out as well. ALAN: So the grade refers to the year of schooling and hence the age of the child. I see. In England, primary school runs from age 5 to 11 and secondary school from age 11 to 18 (though the official leaving age is 16 for those who don’t want to continue their education). Primary school organisation is mildly chaotic though it does centre around teaching by age. In secondary school we refer to form one, form two etc which would probably correspond roughly to your grade seven and onwards. Interestingly in England, form six (ages 17 and 18) is referred to as first year sixth and second year sixth. New Zealand is much more sensible; they call these year six and year seven (New Zealanders tend to say “year” rather than “form”). By the time we get to university (generally around age 18, though a lot of people take a year off first) it all gets much simpler. First year, second year etc. No fancy words. Thanks for clearing up “sophomore” – that one has always puzzled me as well. JANE: My pleasure… I take a sophomoric delight in knowing the right answer. ALAN: I’m not finished with my questions yet… so perhaps you will get to show off some more! JANE: I’d love the chance. However, right now I need to go write. Besides, I’m hoping our readers will offer some variations on other educational systems for your amusement. discussing disasters, as I had originally intended, I thought I’d kick back, relax, and wander on about the more amusing aspects of life. About a week ago, the heat that had been depressing body and soul finally broke. We’ve even had a little rain. It totaled about half an inch spread out between two separate days. That’s not much but at least it’s rain. This, combined with temperatures in the mid-high nineties – rather than averaging around a hundred and five and sometimes as high as a hundred and ten – has given our garden a real boost. We started picking zucchini last week. Already, it’s getting ahead of us. I don’t think we’ll be buying salad makings for a while. Monday I picked our first three eggplants. We grow the “ichiban” variety. The slender, delicate fruit doesn’t have any of the bitterness that you sometimes find in the big, glossy “Black Beauty” variety typically found in grocery stores. I also picked a handful of Hungarian “wax” peppers and a single string bean. Our tomato plants have started setting fruit. Did you know that tomatoes are actually pretty picky about the temperatures at which they’ll set? Too hot. Too cold. Too little wind. Too much wind. Any of these and they’ll grow leaves and vines, but not set fruit. The cucumbers are also flowering nicely. We haven’t found any fruit, yet, but I suspect that somewhere out in the tangle of vines and leaves there’re a couple waiting to surprise us. When I found my one mature string bean, I saw a host of others getting started, as well as a wealth of flowers. We didn’t do well in all areas. The radishes got hit by some nasty black beetles. The chard was slow getting started (but it’s doing great now) and those same beetles did a number on our arugula. Carrots are also behind the usual. Early in the summer, the lilies did very well. The first batch to bloom was the yellows. We had a wealth of huge, creamy yellow flowers. An added bonus was that a breeze would blow a really delightful perfume into the living room. Next were the pinks. These did pretty well, but the heat definitely got to them. By the time the white lilies bloomed, it was easy to see that late summer in the front of our house – even with shade later in the day – was too much for these delicate flowers. The lilies we’d planted out back, however, which got more shade, did very, very well. Therefore, this spring we dug up the lily bulbs from the front and shifted them to the back. We’d lost a rose bush and another shrub to the winter, so we had two neat little wells already full of enriched soil. We added a bit more soil, set in the bulbs, and waited to see if they were strong enough to make a comeback. At first we were doubtful. 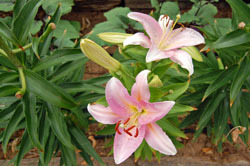 The lilies from the year before came back strong and already had stalks at least six inches tall before the first green tips poked through from the transplanted batch. The transplants also grew more slowly, probably because the bulbs didn’t have as much stored energy. However, I am please to report that they are now flowering. We had a few nice yellows and have now moved on to the pinks. Judging from the buds, I think we’ll have many more to enjoy. Analysis? Risk – both in trying these bulbs in the first place and in shifting the ones from the front to the back – well taken. Those of you who remember my prior post are probably wondering what we did with that narrow strip out front where we tried the lilies. After careful observation of what other people in our area were doing with similar beds with similar orientation, we decided to try zinnias. We put in seeds and are now starting to get flowers. An amusing addition is that we also have two cucumber plants. We’re guessing the seeds were in the kitchen gray water we often use to water that bed. Because the area is so narrow and we’d like to be able to use our sidewalk for at least part of the summer, we’ve trellised the vines up tomato cages. It should be amusing to see what happens. I wonder if we can get them to climb a string up to the gutter? I’m looking forward to finding out! awkward topics one faces when writing historical fiction – even if that “history” isn’t that long passed. Last week, I talked about some of the challenges – and interesting things – one encounters when writing about a long-ago historical period. What is not as often discussed is how time periods closer to our own can blind side a writer. Immediately, I was reminded by how casually acceptable racism was only a few generations ago. True, Upfield chose to model his detective – Napoleon Bonaparte – after a half-aboriginal, half-white friend of his called Tracker Leon. With such a character, racial issues were going to be in the forefront of any story. Coincidentally, I’ve been listening to a bunch of novels by Agatha Christie. (Audio books are my favorite way of making doing chores amusing.) Many of these are from the same general time period as Upfield’s work. From these you can see that even in “civilized” England, casual racism was rampant. Mind you, Christie often demonstrates how short-sighted these views are, but the fact that Hercule Poirot – despite his credentials – is often dismissed as foolish simply because he is a “foreigner” shows how prevalent such ideas were. Captain Hastings, Poirot’s good friend, is not immune to such short-sightedness. To him, his admired associate is the exception to the accepted rule. Upfield also demonstrated how our attitude toward animals has changed in the last few decades. In The Lure of the Bush, a young man who is meant to be quite admirable rides a horse to death, stalks a large cod with the intent of spearing it, and beats a dingo to death with his stirrup iron. Today such behavior would be a quick and easy way to characterize the man as, if not a villain, certainly a brute. Another time, another place, you say, but such differences in attitude can trip up a writer who thinks that people even a short time ago are just like we are today. Consider social habits. A few months back, an on-line review site featured Roger Zelazny’s ten-volume Chronicles of Amber. In the article, the reviewer commented about how frequently the characters smoked. I was amused, since the topic had come up when Roger and I were corresponding. I later touched upon why Roger’s characters were invariably smokers in the biography I wrote. That comment came back to me last week when I was reading The Day of the Triffids by John Wyndham. The main character smokes a lot – and so does his girlfriend, and so do many of the other characters. I found myself noticing this in a way that I’m certain none of the readers did in 1951, when the book was first published. Would someone today writing a story set in 1951 remember that little detail, especially if they’d been born after smoking restrictions went into effect? The more I think about it, the more I’m certain it’s those little details that would trip a writer up, rather than the larger issues such as racism or cruelty to animals or sexism. What do you think would be missed in a novel set in, say, the latter part of the twentieth century or even today? Is there any way writers can make sure they don’t miss something crucial?